Mark Strand’s poem, “Keeping Things Whole,” in the Brooklyn apartment of poet Purvi Shah. I gathered up my nerve and moved to New York City for the first time right after grad school. I was lucky my friend Purvi was looking for a roommate; her cozy, furnished apartment (where I had stayed on many visits to New York) and month-to-month rent made the idea of a big move and a big city less intimidating. 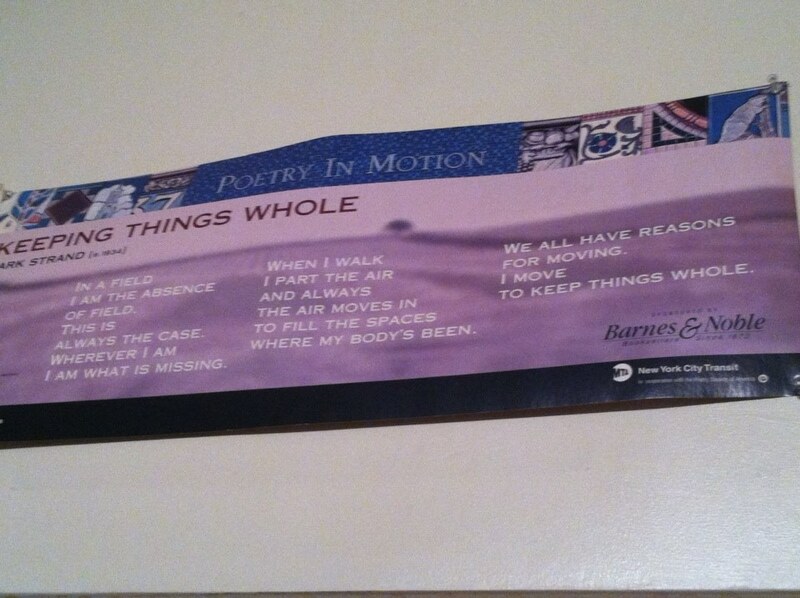 A purple “Poetry in Motion” poster hung (and still hangs) in Purvi’s lovely living room, and my eyes rested on Mark Strand’s poem, “Keeping Things Whole,” each day that year. In 2003, a year after moving in, I left Brooklyn for a writing fellowship in colder Western Mass. I moved a lot in those years–in 2004, 2005, 2008, 2009, and 2011–across hundreds of miles, often across states, mostly for academic jobs or fellowships. But I also moved, perhaps, because I was not ready to stop moving, even though I simultaneously craved stability. Strand’s lines resonate with me as I look back at that time and contemplate the future. His death this past weekend, on November 29, 2014, set me thinking about “Keeping Things Whole.” I glance at Strand’s poem often still (without fully reading it each time, because I use the above image as the cover photo for a Facebook group I created for local writers in Rochester). Thank you, Mark Strand, for the gift of this “beyondness” in your poems. It has kept me coming back. This entry was posted in New York City, Rochester, Teaching, the writing life and tagged New York City, Rochester, Teaching, the writing life. Bookmark the permalink.